Samuel H. Cochrane, c. 1861. A black and white portrait photograph of Samuel H. Cochrane, (1837-1872). 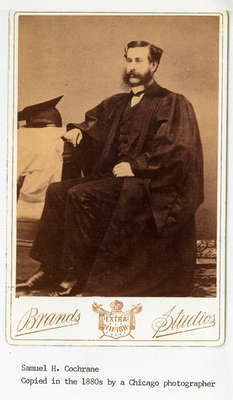 This picture of Mr. Cochrane with his gown and mortar board is probably his University graduation photo, take about 1861. It was likely by a Toronto or Whitby photographer, and was copied by Brands Studio, Chicago, in the 1880's. Samuel H. Cochrane was born at Whitby Township on January 20, 1837, son of Samuel Cochrane and Deborah Powell. He studied to be a lawyer, likely at the University of Toronto and opened a law office on Brock Street, North in 1862. He was appointed Crown Attorney of Ontario County in August 1963 and served in that position until his death at the age of 35 in 1872. Samuel H. Cochrane lived on the block bounded by Brock, John, Byron and Mary Streets and died at Whitby on April 23, 1872. He is buried in Union Cemetary, Oshawa. His widow moved to Chicago to be with her daughter in 1888. Bottom of photograph reads "Brands Studios" and "Extra Finish".